This year as part of our Advent celebrations I am hoping to share a look at some of the more important traditions we have in our family for this Advent Season. 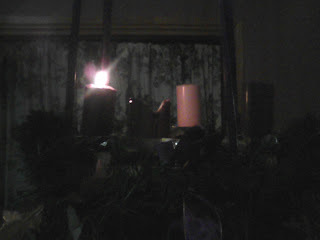 Today we lit the first candle on our Advent Wreath. On the first day of Advent, Catholic families will set up Advent wreath -- a wreath of greenery adorned by a set of four candles -- typically, three violet-colored, and one rose-colored to match the priest's vestments on each of the days the candles are lit. The wreath is either set upon a table (especially the dining room table), on the family altar, on pedestals, an end table, etc., or it can by suspended by ribbons from the ceiling, such as from a light fixture. The candles can be long, slim tapers, small votives, or fat pillars. There can be pinecones and such adorning the greenery, but because Advent is a penitential season, it shouldn't be highly decorated with colorful ornaments. The circular shape of the wreath is a symbol of eternity, and the greenery symbolizes hope and renewal. The colors of the typically-used violet and rose candles symbolize penance and joy, respectively. Each candle also represents one of the four weeks of Advent, and one thousand years of the four thousand years that (at least metaphorically) passed between Adam and Eve to Christ's coming. The first candle also recalls the Patriarchs; the second candle recalls the Prophets; the third candle recalls St. John the Baptist; and the final candle recalls Our Lady. If colored candles are used, the violet candles are lit on the first, second, and fourth Sundays of Advent, and the rose candle is lit on the third Sunday ("Gaudete Sunday," when the priest also wears rose vestments at Mass), a day of rejoicing because the faithful have arrived at the midpoint of Advent and anticipate Christmas. In any case, whether colored or white candles are used, one more candle is lit each week at dinnertime, the progressive lighting of the candles symbolizing the expectation and hope surrounding our Lord’s first coming into the world and the anticipation of His second coming to judge the living and the dead. The candles are kept burning throughout the Sunday supper, and then are immediately blown out afterward (candles can be replaced and greenery freshened as needed). I like the idea of a special Christ candle. Have you got a photo of one you have specially decorated? At Christmas we replace our purple and rose candles with white ones and the wreath continues to sit on our table until the end of the season.